then you can make it more fun for them to practice by combining a number word lesson with a bar graph lesson in math. It's sure to be a hit because students will feel very grown up through this learning experience. Take your students through these topics in the order they are given below for best results. word. Provide an example comparing the number 1 and the number word, one. It has the same meaning, only it is written in word format. First ask the students to create a list of numbers. Next to each number, write the number word. 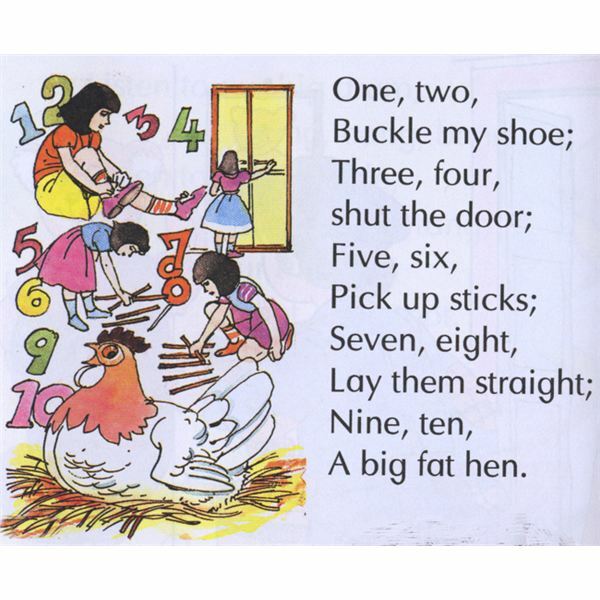 Next, refer back to the nursery rhyme. Show the students the number words again (circle them with a dry erase marker or bold them with wiki sticks). Last, write the number in front of the class (to model the correct formation of the number) on a small sticky note and place it above the word on the nursery rhyme. The students will practice associating the number with the number word on a bar graph. Create a bar graph up to ten (10 columns) on copy paper. You can download a blank bar graph for your convenience at Super Teacher Worksheets. Write the number words on the x-axis and the number on the y-axis. Copy the worksheet onto a poster maker at your school. If you do not have a poster maker at school, you can purchase extra large graph paper from Nasco's Math website to make the bar graph (laminate it and use dry erase markers to use it again and again). Write each digit, 1-10 on an index card and the number words, one-ten, on the back of each index card and laminate. I have created the number word cards in PDF. Just download them and print them on card stock. Then, write the number on the back of each card and laminate. To successfully complete this lesson, students will need the skills: one to one correspondence of number to object up to ten, printing and graphing skills. First, do this as a whole group activity so the students can do it independently as a center game. Tell the students that they are going to randomly draw a number, count the number of boxes on the graph and color them in. For example, the student draws the number 1 and colors one box in the bar graph. The student flips the card over, to find the word "one", and writes it in the column beneath (this makes the game self-correcting, and teaches them that a graph has labels). Last, the student sets the number 1 card aside. Continue in this manner until the graph is complete with numbers 1-10. To make it into a center game, provide copies of the worksheet, the cards, pencils and crayons. Practice game with the students, modeling the procedure. Younger students may need direct supervision to play the game correctly. 1) Check each graph for accuracy, to learn more about student comprehension of number words. 2) Ask the student to provide a sentence with the number word in it or have the students read one of the sentences aloud from the rhyme. 3) Download the One, Two, Buckle My Shoe assessment that I made for your convenience. Students read the number word and color in the correct number of shoes on the table. More Practice: If your students are confusing a letter, a number and a word, read more here at Bright Hub Education. If you are teaching a whole unit on nursery rhymes, you would enjoy my series to teach rhyming words and word families. Reference: Author's teaching experience and classroom work. This lesson plan was successful in a Kindergarten classroom. Modify it up or down as needed depending on age and ability level.